Today we went on a walking tour of some of the oldest parts of Bangalore. 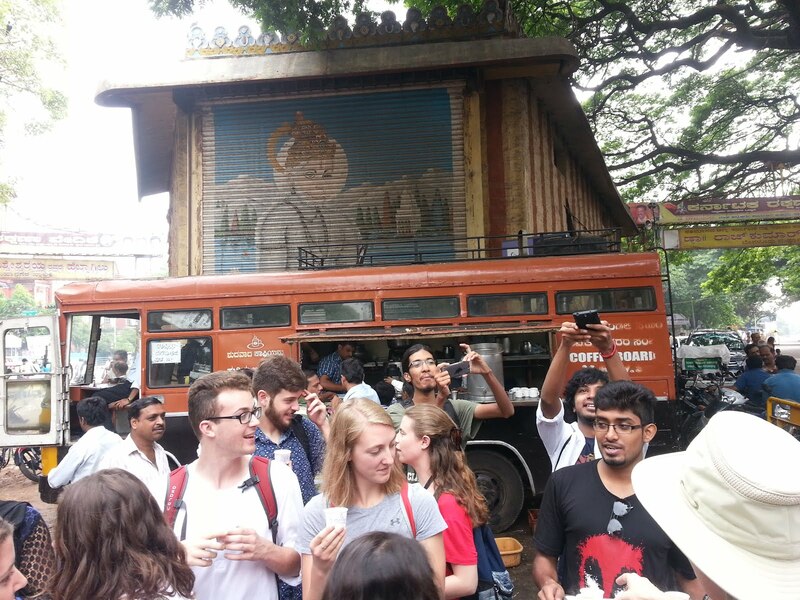 Today we went on a walking tour of some of the oldest parts of Bangalore. Our first stop was a crossroads that serves as a socializing hub for the locals. Every morning, hundreds of people come here to buy breakfast from a street cart or buy coffee from a bus, and stay a while to catch up with acquaintances before the day begins. The bus shown parks at this spot every morning, gets bombarded with customers, and then leaves closer to mid-day. While we waited for our coffee, the regulars made no effort to be discrete while staring at us. 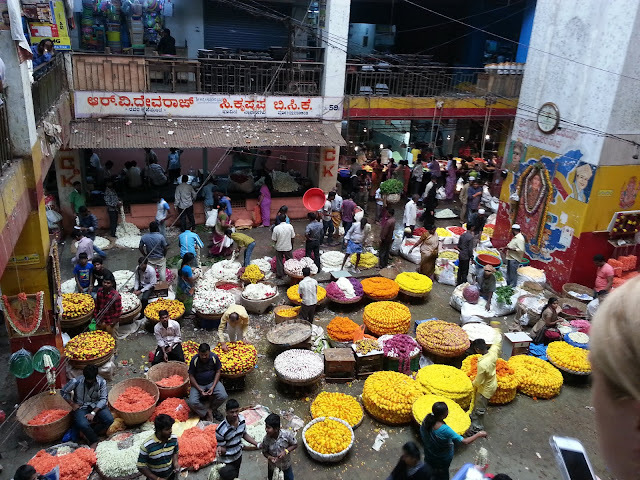 Later, we visited a massive market area where hundreds of tiny shop set-ups sell incredible quantities and varieties of goods. In the middle of it all, workers were arranging enormous strings of flowers to be sold. While perusing the shops on the lower level and thinking that I have probably never seen this many people in one day before, a man reached his hand from his booth, introduced himself to my fellow Minnesotan, Ben, and asked where we were from. After hearing "America," he expressed his excitement by saying something along the lines of "ah, world leaders! champion county!" We moved on through the stuffy, humid air, and I found it hard to imagine how unpleasantly hot it gets down there. It was very fascinating to observe what looked like many instances of chaos and disorganization come together and result in one enormous commercial operation.